I have introduced separate pages for "split" or "divided" authors. PLEASE READ THIS: This is VERY rough stuff. There are million implications that need to be worked out. There are a million more features that need to be added, and at least a half-million features this breaks. If this state of affairs surprises you, welcome to LibraryThing! See below for notes on bug reporting and the philosophy of author division. 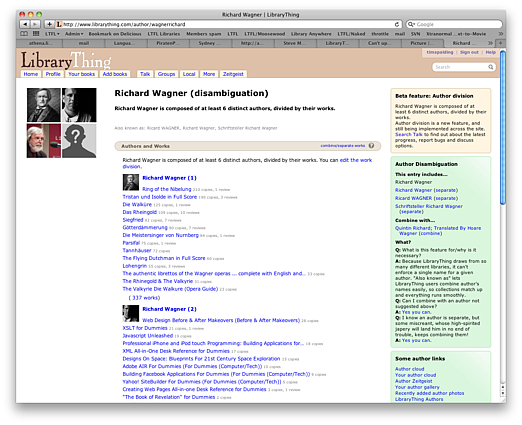 When an author has been divided, the main page (eg., Richard Wagner) becomes a "disambiguaton page." The page itself is largely reduced to a list of the divided authors and their works. But also notice the images to the left. Bug reporting. I have added a whole bug category for "Author division." For now, I would appreciate if members stuck to bugs with the feature as it is, not failures to extend the feature throughout the site. Believe me, I know there's a lot of work there. Anyway, the latter will not necessarily get action, because the logic of the code makes the details of the roll-out plan beyond member influence. Philosophy. I am going to start a second thread for the "philosophy" of the thing--how LT approaches author combination and splitting, and how we're getting it wrong or right. Rescue dogs are so lovable. Mine has strange quirkiness. Congratulations on your new family member!! In essence : I love it. (Wil be a lot of work to get the pictures to the right "split person" though). Congrats on the dog - will we get pictures? This is really gonna change things around here! Wheee! Experimented with the CK and links on James Baldwin - adding CK to James Baldwin (2) seems to work, but editing the links also changes the links on James Baldwin (1). Work pages don't link back to the author that they're assigned to -- I'm assuming that's a not-yet-implemented feature, rather than a bug. I don't know if it counts as a bug, but there's a serious danger of losing lots of data here. Putting all the CK on author one's page means the disambiguation notice is only found there, and not on either the disambiguation page itself or on any of the other author's pages. This makes it very easy for someone editing author one's page to wipe all the data on everyone else. Yes. Work linkages are the really big thing that has to happen across the site. Basically, most of the links don't "know" which sub-author it is. The data isn't being loaded. So, yeah, much to do. The disambiguation notice on split pages often contained information about all authors, that is now only on the first author's page. If someone edits out what doesn't apply to the first author, it could be lost when it would have been useful for the other authors. It would make a lot of sense to have it on the disambiguation page, or copied to all authors pages. Okay, so we're only talking about the disambiguation notice, right? If that's doable - yes please. Exactly! Have a look at the notice on http://www.librarything.com/author/wilsonjohn-1 to see the level of information involved. The more I think of it, the more important that seems: if I want to assign a new work to one of those 59 John Wilsons, I don't want to have to search all 59 pages to find the right one - that information should all be in one place, somewhere. So the ideal for me would be to copy across the notice to both the main page and all the split pages. Then the notice on the main page can be kept as it is and updated, while the one on each split can be edited down to the relevant person. Another vote for the disambiguation notice to appear on the front, disambiguation page. Essential to my way of thinking. It occurs to me that, for the majority of split authors I have seen, there is not much CK anyway, apart from gender. My practice has tended to be to erase dates of birth, other names, etc and edit the disambiguation notice appropriately so as not to lose the data. If it isn't easy to separate the disambiguation notice from the rest of CK, why not simply have all the CK on the disambiguation page and author (1) page. As long as CK on the pages are not linked, passing splitters and combiners will soon erase most of it from the disambiguation page. One for works written by Lodewijk van Deyssel using A.J. as a pseudonym, one for works authored by A.J. Wood. The disambiguation notice I added is now on the page of A.J.(1). It would be nice if I now could combine the two different A.J. 's with either Van Deyssel or Wood. Thank you for rescuing a dog, Tim. Thank you so much for adopting from a shelter! But we need to know the important things - what kind of dog, what's its name, and when do we get to see pics? Oh, and I am beyond thrilled with the new feature, too. Seems to be a tag issue, though, as all the "related tags" attach to all the Richard Wagners, when with one or two exceptions, they all relate only to Richard Wagner (1). Another vote for the disambiguation notice to appear on the front, disambiguation page. And I also vote (though this is a separate issue) for CK to be open. I just split an author, and couldn't find the CK at all! I thought I'd made the disambiguation notice disappear entirely. Turned out that I had to click on the other languages to open the CK. This isn't a) intuitive, or b) explained. Oh my god. This has been my most-wanted feature for ages. Thank you so much. Yay for the work on the new feature and good luck with the new dog. It's nice to see that the fine Chicago tradition of voting often is still going strong! Take care when naming your new dog --- unique name please --no disambiguation page needed. I think you've hit on a way to minimize complaints about new features: adopt a pet at the same time! ;) How many times do you think that's feasible? Also casaloma - excellent idea. Tim, don't name the dog "John Smith"
I've got 15 dogs in the house right now. Disambiguate? 18> The disambiguation notice applies to all the authors, not to any one in particular. So what's the argument for it also being on the author pages? 37> Because the CK edit fields are available when on the individual author page. And when you change them, it changes them for ALL authors, not just that one. ETA: Which I think is still a bit of a problem. I'm beginning to think the DN should come FIRST. A long awaited addition. Thank you. One request: I'd like to see the unknowns on all of the author pages. I fear they won't be noticed if they only appear on the disambiguation page. As I said in 18, the one on each split can be edited down to the relevant person. If you put the present disambiguation notice on every split page, then every author page has the available identifying information, along with a lot of extra which will need to be edited away. Otherwise, we can wait for people to copy across the relevant information from the main page onto the split author pages. But there's no guarantee that anyone will get around to all those pages anytime soon, so my preference is to put all the information onto every page now while it can still be done automatically. I see a lot of work ahead but I will be happy to work at it. Thank you for coming to a solution for this problem. But first I am moving to another apartment so packing up has to be done. What are you naming your dog, or does s/he come with one? I've just separated /author/paige from /author/paigelaurie (they should never have been combined). The Paige page is currently split, with works from Laurie Page (1) and Rob Paige (2) *. I think the name on the disambiguation page should just be "Paige", but it should be possible to set the Canonical Name appropriately on each split page. Currently, the disambiguation page appears to pick up the Canonical Name from the first author's page. Should there be a separate Canonical Name field for the disambiguation page? * I'm not sure the assignments are correct, but I'll leave them as is for now. Thank you! This has been something I've wanted for a long time! Now off to explore. ETA Having now explored just one book of mine that had an author who needed to be split, I second/third/fourth/whatever the need to have the disambiguation notice at the very least on the disambiguation page, but ideally in the CK for all the split authors. 38> Because the CK edit fields are available when on the individual author page. And when you change them, it changes them for ALL authors, not just that one. I don't understand. Tim said that each author page would get its own CK so changing it on one author shouldn't change it for the rest unless something is horribly wrong. And the way I see it, the disambiguation notice field should be removed from the author CK and added to the author disambiguation page. I don't know if it would be considered CK at that point or not. 40> If you put the present disambiguation notice on every split page, then every author page has the available identifying information, along with a lot of extra which will need to be edited away. What identifying information is in the disambiguation notice that isn't in some other CK field? If there's some interesting info that's being put in the disambiguation field for the lack of a better place, you should lobby Tim to add a CK field for it. Otherwise perhaps Tim could add a Notes or Other Info CK field. 46> I don't understand. Tim said that each author page would get its own CK so changing it on one author shouldn't change it for the rest unless something is horribly wrong. Ah, well that's just wonderful! I somehow missed or misunderstood that bit. Excellent news. I think we may be talking at crosspurposes here. I'm talking about what's there at the moment, and the way to conserve that information while switching to the new system. We've already used that John Wilson page as an example a few times: http://www.librarything.com/author/wilsonjohn-1 At the moment, it has about 40 birthdates which were put in the disambiguation notice as identifiers. It made no sense in the old system to list 40 different dates of birth in the date of birth field. It makes sense in the new system to transfer those birthdates into the d.o.b. field on the individual author pages. What I'm concerned about is how that info is treated in the meantime: I think that automatically duplicating the disambiguation notice, as a once-off snapshot of what's there now, is the best way to make sure nothing gets lost. What identifying information is in the disambiguation notice that isn't in some other CK field? The main CK all refers to the explorer, but the disambiguation has useful CK information on most of the others. And congratulations on the new dog! 48> I'm talking about what's there at the moment, and the way to conserve that information while switching to the new system. I'm concerned that your taking a problem of transitioning from an old to a new system and creating something permanent for it. If your saying duplicate the disambiguation notice into the individual author pages for two months until we can get everything copied then I'd go along with that. If your saying duplicate the disambiguation notice into the individual author pages for two months until we can get everything copied then I'd go along with that. I'm saying duplicate the notices until we can get everything copied. I don't think a time limit is feasible (let alone a two months one!). Hey Tim - Thank you, for all you do for us! Also, congrats on the new dog. Have fun getting her settled. 53> I don't think it would be that much trouble to open the disambiguation page in one tab and each sub-author page in a different tab and copy and paste from one to the other. Thank you, Tim! I am delighted! Please update us on the name for your new puppy too! And photos! We need photos. >55 jjwilson61: I don't think it would be that much trouble to open the disambiguation page in one tab and each sub-author page in a different tab and copy and paste from one to the other. I do! I'm with Eveleen on this. I think Tim has already agreed to put the disambiguation notice on the disambiguation page. I have no idea whether it is feasible to put it on every page but it would certainly save some clicking. As to what happens then - I can't believe that anyone taking the trouble to enter CK properly wouldn't also erase the now irelevant disambiguation notice. >48 EveleenM: I had a look at Richard Burton, whose disambiguation I remember working on a while ago. There is an interesting anomaly on RB (2). On the disambiguation page he has 3 works, on his own page 4. The extra work is Bitter Victory. Clicking on the work shows it with Nicholas Ray as author, and indeed it features on Nicholas Ray's author page. The one copy belongs to a private library. I can see nothing on the work page to suggest a connection with Richard Burton BUT RB starred in the movie - LT is cleverer than we think! The work is on two pages at once - a bug? Thanks for letting me play hooky, people. The drive to New Hampshire was hell, but I made it, and Sarah (or maybe Josie), is great. She's going to be great late-night coding company. Will work on bugs, extensions later in the evening. I don't think it would be that much trouble to open the disambiguation page in one tab and each sub-author page in a different tab and copy and paste from one to the other. I think it's worthwhile to save a bit of extra trouble on each page when we're dealing with thousands of pages to be fixed. Cute pup! Obviously the trip was well worth it. 62> Not when it causes the creation of a field in the author CK that doesn't make sense (disambiguation note doesn't make sense when there is only one author) that will likely be there forever (Do you really think Tim will ever bother to remove it once it's there?). Have a look at every author page - there is already a disambiguation note field in CK for all single authors as well as the split. Usually empty, I grant, but there. well of course it was hell...driving in a snowstorm will do that. congrats on the dog. she looks bouncy. Quite apart from splitting authors, the disambiguation notice is useful for warnings about what authors not to combine. (As an example, see http://www.librarything.com/author/devereaubrey or http://www.librarything.com/author/capekkarel or http://www.librarything.com/author/publishingdk). Also, good luck with the dog! I want to make a few comments about this much wanted change. I had to figure out which authors I had split, because I've done a fair number. I came up with John Gill (link: http://www.librarything.com/author/gilljohn ). I remembered that older Baptist ministers tended to have common sounding names and Gill was the first I found through a CK search. I think someone else had already provided a Wikipedia link. When I went to it, I had discovered it was a Wikipedia disambiguation page. Normally, I change the name of the link from the Default "Wikipedia author page" to "Wikipedia disambiguation page". This disambiguation link is now attached to author # 1, and I wonder whether the main page should author page should have links to the disambiguation pages of other sites? With author 1, who has fewer books than author 2, I did find that my occupation entries for author 2 were still there. My practice for this kind of CK, is to put (#2) after the occupation -- I know this is not de rigueur. I was happy to see that my numeral references were preserved. I then typed in the two occupations for author 2 on its page -- I assume there is no easy way to get them there otherwise. But I did leave author #1 with the #2 occupations as originally marked. I think we're stuck with the order of authors as people have done them already. When you work on splitting authors, you don't always start off knowing who is going to come out with the most books (John Gill's splitting was started by someone else, so I idn't want to spend a lot of time redoing the other helper's work). I have had only one experience where authors got renumbered. This was when I realized for some author (whom I don't remember) that #9 and #12 were the same person. So, I used # 9 for the combined author, but authors 13 1nd 14 got renumbered to 12 and 13. I hope there isn't any automatic renumbering after people start working to make these pages more accurate. I also notice with John Gill that another link is included with Author 1, and I believe that this should be a link for Author 5 -- it would be nice to have an easy way to correct this. Unfortunately, I don't think I put this link in. I usually put the author # by the link name, so I can figure out to whom it belongs, if I should go back to the page, and this one doesn't have a # by it. 67> Quite apart from splitting authors, the disambiguation notice is useful for warnings about what authors not to combine. Alright, that makes sense. I drop my objection. 68> Could you make the Canonical Name for each author be the name that shows on the disambiguation page? I was looking at the page for American M* Association and I had to go to the work page and look at the editions sub-page to figure out what each one really was. I'm not going to rush in and do anything rashly, but I was wondering whether this feature can be used to correct works that are assigned to the wrong author. To take an instance that I came across today, there are two different books whose title begins The Latin Letters of C. S. Lewis. One is a translation of the letters by Martin Moynihan. Quite properly, C. S. Lewis is shown by all of its owners as the primary author. The other is an essay about the letters written by Mr. Moynihan. Most LTers who own that book attribute it also to Lewis, who didn't write a word of it. Only two, so far as I can discover, have Moynihan as the primary author. It seems to me that I can now split C. S. Lewis into two authors, give the second the Moynihan-written Latin Letters essay, then combine him with Moynihan, after which all of the editions of the book can be consolidated. Would that be a proper use of "Author Division", or would it cause other problems that I'm not seeing? No! Do not combine two different authors simply in order to get books combined. You can combine editions, and if they don't show on the editions page, people in the Combiners! group can help. But if you combine Author X and Author Z, it's a disaster waiting to happen. Someone will "unsplit" your two C.S.Lewis', and the next thing you know, all of Mr. Moynihan's books will be combined with all of Mr. Lewis', and, well, all I can say is, "oy vey iz mir!" Oh, well, so much for that brainstorm. Awwww a doggie!! You'll be posting a picture of her, right?? I honestly *screamed* when I saw this announcement. My mom got mad at me. ..... That's how excited I am. I haven't even poked around yet, and I don't really care about possible bugs right now, I'm just SOOOOO EXCITED that this finally happened!! This is still happening? I'm dumbfounded—and firing up my PC. I'm not sure I understand the second sentence. What I'm going to do is this: The disambiguation notice will be shown on the disambiguation page. It won't, I think be shown on the divided pages. Interesting. How about if I just put a notice that there are X unidentified works? She's going to be Sarah. We don't really like it, but she's already had one change--we don't know her original name, or if she had one--and our replacement, Josie, isn't sounding right. Liam is convinced she's a Sarah. Ah. Got it. No, it was a bug, affecting Internet Explorer. All good now. Wow, thanks! Oh, and Liam's "Sarah" beats "Phydeaux" any day. 69> vpfluke (and others): Any thoughts, suggestions, advice, directions on how we ferret out which now-disambiguated authors we previously gave CK for? I'm going looking now; but, you know, just in case I don't make it back, they'll need to know which way I was headed when last seen ... . Thanks! Your dog looks alarmingly like Hyperbole and a Half's. Hopefully yours is smarter. I've removed the "Disambiguation notice" from CK on the divided authors. I've added it to the "Disambiguation page." Disambiguation is now on ALL un-divided authors and on the disambiguation page of divided authors. It is removed from the sub-pages of divided authors. 88> And the group finally convinced me in 71 that the disambiguation notices should also be copied to the divided author pages (but as a different field from the one on the disambiguation page I think). (Eveleen's going to kill me). Can you look at 72 about canonical names? If you're looking at Canonical Names, please also look at message #42: the Canonical Name from the first page is used for the disambiguation page. It's better than nothing. I suspect committed combiners will follow the link, but there may be a reduction in combinations by less committed people who simply notice two books with the same title that need combining. On another topic, is it possible to move author photos? The photo attached to David Anderson (1) actually belongs with David Anderson (3). You have to look at the disambiguation page now to see that, but I think it should be shown on the sub-page as well. Yeah, I was all set to use the disambiguation notice on the sub-page for that purpose and then it disappeared. Joking, really. I think you need to be able to combine a split with another page. Lots of posts and threads, and I've lost track, so I apologize if this has been addressed before, but is there an easy way to move author pictures to the right divided author page? This is a great idea. One situation which has always bothered me is that there is a LibraryThing author called David Mitchell who is not the popular writer David Mitchell of Cloud Atlas. Somehow, the notice of the LibraryThing author has not been split off into one of the disambiguated David Mitchells and I cannot see how to correct it or where to suggest the correction. Well, no. We need to be able to indicate that Charles Nelson (3) is the same fellow as E. Charles Nelson, and have those books listed there. After much thought, that's how I think that's a necessary feature. Divided authors should be capable of being combined into other main authors. This will also solve the "Nelson" problem--books with just a last name. Nelson should be divided, and then its divisions forwarded to the respective authors. Note, however, that I am proposing combining divisions into main authors, not into other divisions. So, if some of the Charles Nelson books belong in E. Charles Nelson, great. But if they belong in E. Charles Nelson (5), that partitioning is done on the E. Charles Nelson page, as part of its work splitting. I think you need to be able to combine a split with another page. is there an easy way to move author pictures to the right divided author page? No, there isn't now. Usually you can just delete and re-upload. I'll look into making a tool, but it's not at the top of my priorities. The main page has to have all the info about each author. There may be a reason why I'd want to make a notice for, say, author #3 about not combining with another author. No, because combination only happens on the top-most page, the disambiguation page. Right. David Martin author of Cul de Sac is the same guy as David Lozell Martin author of Losing Everything, but they're separated into different authors on LT.
Anne Smith is split 3 ways... and so on. Those are made-up examples but there are actual chains of overlapping names like that. So how would the combination work in that case? They should, I think, be combined. Are we trying to preserve pen names? All good. The only wrinkle is that to effect "Anthony Smith(6) is also found under A. H. Smith (1)" you point Anthony Smith (6) to A. H. Smith, not A. H. Smith (1). That gets Anthony Smith's books into A. H. Smith, from which you can divide them into the various A. H. Smiths. Joseph Green, science fiction author, is also Joseph L. Green, science fiction author. (Some books show the middle initial, some don't.) I'm not sure how to combine them now. BTW, weird things are happening with editing CK on author pages since this change. I posted a bug report about one problem, and someone else posted one about another problem; not sure if they're 2 different problems or two manifestations of the same underlying problem. 102, 103 - Yes, I'm confused here too. I'm confused by your suggestion to combine David Martin and David Lozell Martin. we would keep them all separate. Are you saying that now we should combine them all, and just use the author work division system to separate them? That doesn't seem an optimal solution. Or do you mean that we are still waiting for a system where we'd be able to combine a split author - and ONLY that split - with another author? In other words, that we should be able (at some point, but not yet) to combine only one split of David Martin with David Lozell Martin? Right. That's what I'm saying. We need to make it so that Jane Doe (X) can be combined into Joe Shmoe. To address your case, therefore, David Lozell (2) should be combineable into David Lozell Martin. However, if every single work under David Martin belongs under one or more splits of David Lozell Martin, the former should be combined into the latter. Why is it that edits to author CK are going not to the appropriate language versions of CK but to number versions of CK? No. Not intentional. Will get to after dinner. I don't do much author combining/seperating, so some of this is going over my head. That's okay, tho, 'cause I get the basics of it all. Sorry, I haven't read the whole thread, but is this going to mean that many of the images I've added to multiple-author author pages may now be flagged and deleted? And is there a way to move existing author images to their new homes, or will they just have to be re-uploaded? #99 - I'll bite. How does one remove an incorrect photo from an author profile? Incidentally, for everyone who's playing with this, changing the canonical name on any of the divided pages changes it to the same thing for ALL of them (as far as what's listed on the disambiguation page and the top of each page). That's clearly a bug, but worth bearing in mind before getting into lots of CK changes. I don't know what's happening with other CK fields. Give me some examples of authors with images like that? Problem mostly fixed. Anyway, don't worry about entering the data. The data gets into the right place in CK. What shows up as the author on the page is a display issue we can work on. > 115: Well, Frank Thomas for instance (http://www.librarything.com/author/thomasfrank just in case the touchstone doesn't stick). There are now 2 author pictures connected to FT1, the one actually showing is correct for that author, the other one is in fact FT5. Not sure if anyone else has noticed this, but there appears to be a problem with Christopher Golden (http://www.librarything.com/author/goldenchristopher). It says it's a disambiguation page, but there are no seperate authors listed, and no links for further pages. There is also some red text above the picture: Warning: Invalid argument supplied for foreach() in /var/www/html/inc_author.php on line 687. Someone had gone into Split the author, and saved it as split without assigning any splits. I've changed it back to Keep undivided. Tim, don't forget that you created a bug category for this feature and people have been adding bugs in the Bug Collectors group in addition to reporting them on this thread. 115 - Francis Bacon - has images for both Francis Bacon 1 and 2 attached to 1. First, there is a slight complexity when there are three levels. For example, David Anderson (14) is David R. Anderson (1) and also David Ray Anderson. There are two ways to do the combination. b) Combine David Anderson (14) into David R. Anderson. Make the split assignments and then combine David R. Anderson (1) into David Ray Anderson. I think (a) makes more sense in general. But (b) shouldn't break the system because people will do it that way whether through inattention or because, say there were no David Ray Anderson books when the first combination in (b) was made. Second, David Anderson (4) is David F. Anderson. There is an author page for David F. Anderson but currently there are no books there by David Anderson (4). Should David Anderson (4) be combined with David F. Anderson and given a split on that page? There's nothing to be gained at the moment, but people may add books by that author under David F. Anderson in the future. A related question: should canonical name be used to add middle names and initials to the sub-pages when they are available? Or should that information just be put in the legal name field. >111 BOB81: & >115 timspalding: Tim, here's an example. The photo associated is definitely not the correct Bill Richardson. I'll post it in the bug collectors thread too, to make it easier to stay organized. My understanding is that "canonical name" is the name by which the author is most widely known. I don't see much benefit to deviating from that, especially since people will inevitably add different middle names and initials. 121 A related question: should canonical name be used to add middle names and initials to the sub-pages when they are available? Or should that information just be put in the legal name field. My view would be that if the author sometimes publishes under a name using the middle initial or middle name, it would make sense to put that in the canonical name field, to help distinguish the authors. If they only publish under John Smith, though, then I'd probably John Henry Smith only in the legal name field. >102 timspalding: Are we trying to preserve pen names? This is a marvelous and long-awaited development - many thanks! Is there a way to "un-favourite" the disambiguation page? At the moment my "favourite authors" include both George Grant-2 and George-Grant (the disambiguation page). Many thanks! 127> I think that's one of those follow-on projects that'll be tackled when the main functionality is stable. Minor detail: is there any way to remove an author pic without replacing it with another one? 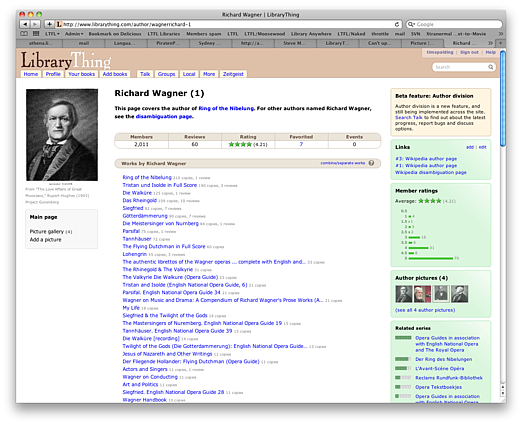 Coz, e.g., in the example above Richard Wagners (4-6) have a photo of Richard Wagner (1) on their individual pages. This doesn't appear to happen when there's another pic available but blanks seem to default to Author (1) rather than Blank. I suspect if falls under what Tim said in message 1, "For now, I would appreciate if members stuck to bugs with the feature as it is, not failures to extend the feature throughout the site. Believe me, I know there's a lot of work there. Anyway, the latter will not necessarily get action, because the logic of the code makes the details of the roll-out plan beyond member influence." Thanks, eromsted. I am content to wait as long as someone knows about it. I think it's great that we have begun the separation process AND that Tim has a new dog! Sorry if someone's asked, I only skimmed messages. Will the tags be working themselves out to correspond to the authors? I added CK info for Ken Weber (2) http://www.librarything.com/author/weberken-2 and notice that many tags refer to Ken Weber (1) books. Thanks so much for this change -- very nice. See 131. I've been biting my tongue over the Male or Female and the Dead or Alive memes not looking at the right page for split authors, but Tim asked us not to bug him about that stuff yet. Tags are attached to specific books, and so they should follow those books as the corresponding works are sorted between divided authors. I expect it will take awhile before everything is migrated properly. But I hope not too long! So, to be *completely* clear, there is a fix in the works (no matter how far away) to attach a work to the proper split author, right? Somewhere up there, I remember seeing someone say it was a boatload of work to get that done. Still and all, feature is very much appreciated here. Blessings on your shelter-dog-havin' self, Mr Spalding. Pictures of pooch? Where? Matt, thank you! Tim, Sarah is a complete doll! By "attach", I assume you mean "make it so that links from that work to an author go to the divided page", rather than "associate a work with the correct division", right? Because the latter has been possible since we got the halfway-there "split" part, after all. >140 lorax: Far better put, and yes indeed, that is exactly what I meant. Thanks for making it clearer. As an LT author with a name that is far from unique, I am so pleased you've done this! I've been hoping for this every since I joined LT in 2007, and I'm delighted that - at least in my case - it seems to be working so well. This is a minor thing in the scheme of things, but if you "favorite" an author that is on a disambiguation page because 6 other authors share his name, shouldn't the canonical name that appears on your profile page be the one pertaining to the author you favorited, and not the "shared name" of the 7 authors? For example, if you favorite Sir Walter Scott, author of Ivanhoe, shouldn't "Sir Walter Scott" appear on your profile, and not Walter Scott, the shared name of 7 distinct authors? It would seem that my "authors without pictures" count in the "author gallery" jumped from about 19 to 66 when this change happened. Is there a simple way to restore the authors that were pictured previously? Or, for that matter, even a difficult way to do so? I hear you on this, but it would have been difficult to figure this out and I think using #1 is more consistent. Anyway, obviously it is moveable. Yes. I'm going to be working on this problem. The problem--which is also at play in memes and author clouds--is one and the same, and rather involved. it would have been difficult to figure this out and I think using #1 is more consistent. Anyway, obviously it is moveable. I can see that my "favoriting" of Charles Williams has resulted in the Charles Williams (1) showing (to me, anyway - private account) that I "favorited" him - correctly, as it happens, but if I meant one of the others I could easily change it. However, the "Favorite authors" link on my profile leads to the page with all the Charles Williamses, and not to Charles Williams (1). I get it. No. I need to change that. It should go to Mr. 1. I'll change it now. OK, even less important, but I'll point it out -- you've fixed the issue addressed in #144, but now on my Author Cloud, Sir Walter Scott shows up without a star next to his name, even though I've favorited him. It looks like the Author Cloud is referring to the disambiguation page rather than to Walter Scott # 1. Re: >154 Betelgeuse: -- I see that as of this morning this has been fixed, thank you! 1. Martin Luther King, Jr. is listed as "not set" in my male/female list. 2. Although I have a book by Hans Hofer, Insight Guides Nepal, when I go to his author page, the book is not listed and there is no check mark. Thanks, Eveleen. I am not sure I understand the recalculation business, but I appreciate your help! I just noticed that we now have combine/separate pages for each division. Thanks, Tim, now I can finally deal with those poor orphaned singletons of Gilgamesh and so on! The first has eight works, the second only one, the last on the list. All eight show up on the disambiguation page as well under Anonymous-11. So it looks like this feature may not quite be ready yet. Thanks for the bug report. Yesterday and today are all about authors. That's a good place to start. I really like the new way to examine the precombined author names. That is a Big Help!! Thanks. It looks great now. It doesn't seem to work properly with LT Authors. On the http://www.librarything.com/zeitgeist/books page, Cloud Atlas by David Mitchell is listed as third most popular book by an LT author; however, that's the wrong David Mitchell. When I took a look at David Mitchell, I see that the Related Tag list (on the individual pages) is the same for the first four authors listed on the disambiguation page, then the 5th author seems to get relevant tags for him. I saw this also on the Charles Williams page (where the fourth author gets the correct tags.) Link = http://www.librarything.com/author/williamscharles .